The outside world might never have heard about the suspected massacre if not for some barroom boasting by a group of miners fresh from working an illegal gig in the Amazon jungle. According to the New York Times, the government closed five of the 19 bases it uses to monitor uncontacted tribes and prevent incursions by miners and loggers. Three of the closed bases were in the Javari Valley, home to more uncontacted tribes than anywhere else on Earth. For obvious reasons, little is known about the indigenous group involved in the suspected killings. 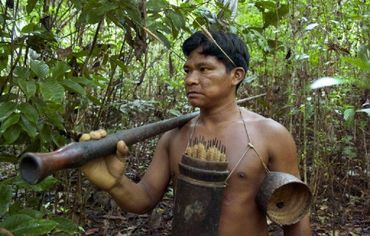 Locally, Lorenzi said, they’re known as Fleicheros, or “the ones who throw arrows,” but their language and customs — and how they interact with at least two other uncontacted tribes in the immediate area — remain a mystery. Noted. Thanks, Phyllis. This is so unbelievable! I hope those gold miners are thrown into solitary and fed only bread and water every other day. This is truly a case of shedding the blood of innocents! I agree, how horrible and then to brag!!??? The sad thing is that as long as there's a lot of money involved, in this case gold, the authorities will look away, not bothered by the death of people they hardly knew existed and care even less about. This is too awful for words. I had read about this horrific massacre on a news site here in Au. Hope the authorities act & meter out justice for the forest innocents. Greedy Corporations have much to answer for in this Universe. Really, this should be taken to justice! Horrid! They are after gold and kill innocents. Brazil must have a Republican Party. Truly UNBELIEVABLE !! WTF ! Greed. These murderers must be punished, but there is lots of money involved. Thank you for the story, Phyllis. I wish I had a majic wand that I could wave to protect the Amazon Indians and their land and way of life which seems so much superior to ours. The indigenous tribes must be protected against gold miners and other miscreants! Scum of the Universe! The murderers of those defenseless tribespeople need to be prosecuted and punished as severely as possible. When some people smell money, their morals go AWOL. When those in power do evil, it is overlooked as long as money is to be made! These people have no conscience or heart, but for what benefits them. Those people massacred will be lost & forgotten, nothing to be gained by investigating such crimes This is the world we all live in. God have mercy on those poor people souls who died! Thanks for informing us Phyllis. It's time now for justice to take its course! Thanks for posting, Phyllis. so horrible, hope there will be some justice!! I hope for justice for this tribe. If they killed off the entire tribe no amount of justice brings back a unique culture and a people; however they still must be held accountable. Nowhere is safe in this world anymore from the Greedy Heartless Ones. There are always enough low lifes to do the bidding of the evil ones that want the lumber, minerals, oil, or whatever is there and they'll kill or do whatever is necessary to obtain it. Grotesque actions by a bunch of mudering thugs. I hope they are hunted down and punished. Noted thanks Phyllis. This is disgusting abuse of innocents who for obvious reasons do not want to be apart of modern society!!! May Justice prevail!!! Shameful action by shameless monsters!!!!!!! Thanks for posting, Phyllis.